IBM POWER7+™ processor is available at frequencies of 3.6 GHz, 4.2 GHz, and 4.3 GHz. Larger IBM POWER7+ Level 3 cache provides greater bandwidth, capacity, and reliability. Integrated SAS/SATA controller for HDD, SSD, tape, and DVD supports built-in hardware RAID 0, 1, and 10. Improved IBM Active Memory™ Expansion technology provides more usable memory than is physically installed in the system. 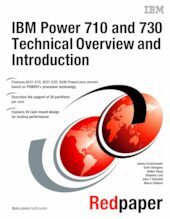 This paper expands the current set of IBM Power Systems documentation by providing a desktop reference that offers a detailed technical description of the Power 710 and Power 730 systems.